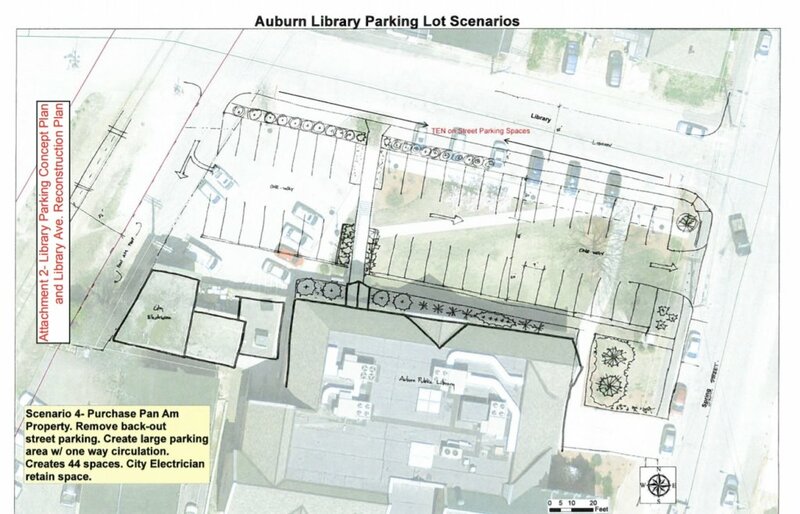 AUBURN — One of a number of options to replace parking at the Auburn Public Library that was lost to a development deal would replace the entire back lawn with 44 parking spaces. Since the city sold the adjacent lot on Troy Street that is used by the library for overflow parking, city and library officials have been mulling options for expanding parking for library users. 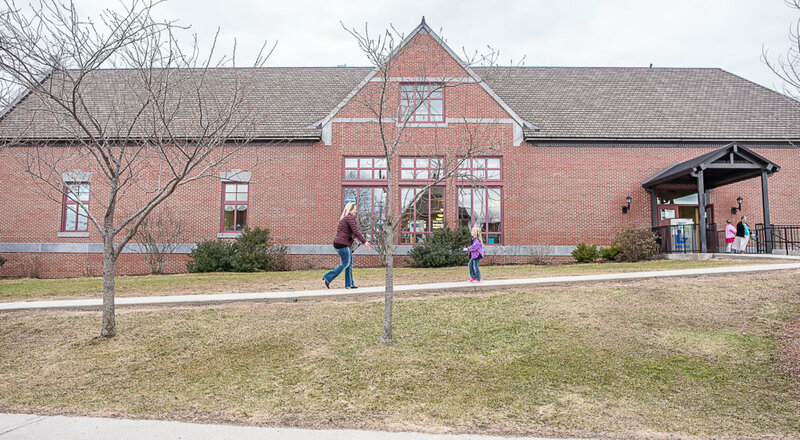 Following a library board of trustees meeting Wednesday, in which the board was presented with replacement parking options, library Director Mamie Anthoine Ney said the board was split on the proposal that would remove a large section of green space. But, she said, the board is looking at a number of options and could combine elements to find the right balance. She said the city will host a neighborhood meeting, which will be followed by another library board meeting, before any decision is made. The Troy Street lot at the corner of Hampshire Street was sold to Portland-based developer The Szanton Co., which recently received financing for its 53-unit workforce housing project. As part of the development process, the City Council agreed to discontinue a portion of Troy Street to allow access to the housing project. Ney said Wednesday that the board “could see both sides” of the proposal to use the library lawn for parking. It’s one of four options, she said. The four options outlined by Doug Greene, Auburn’s urban development coordinator in the Planning Department, would use a combination of reconfigured on-street parking and land acquired by Pan Am Railways to create new spaces. However, the parking lot proposal would result in the most visible impact on the library. A rough sketch by Greene shows a large parking lot in place of the back lawn, with a one-way circulation from Library Avenue to Spring Street. From an aerial view, the lawn surrounding the library — along with the Chapman House parcel — features most of the significant green space within a few blocks’ radius. Ney said the library accommodates “all types of users,” which highlights the need for varied parking options. Some customers need short-term parking for quick visits, while others require more long-term parking for attending community events or meetings. Former City Councilor Tizz Crowley said Wednesday that many residents are concerned about the parking lot plan and the city’s handling of the Hampshire Street development. A City Council workshop to discuss the parking proposals was originally scheduled for April 2, but the item was abruptly removed from the agenda prior to the meeting. Ney said leading up to the April 2 meeting, the library board had not yet been presented with the options, which occurred Wednesday. However, the initial City Council packet contained details on the proposal, including that the new parking lot is estimated to cost $250,000 and would be funded through a combination of tax-increment financing and federal HOME investment partnership program funds provided by the Department of Housing and Urban Development. He said now that the board has seen the plans, the city will move forward on scheduling a downtown neighborhood meeting, which he said will be finalized in a few days. Since the Szanton development was approved, Greene has been working on plans to improve parking on Library Avenue, to develop an immediate parking plan for the library, and to produce a larger plan for walkability and parking in the downtown and surrounding areas. Some options consider creating more long-term parking across Court Street from the library, but Ney said board members were “nervous” about the idea of having more customers traversing the busy street. Ney said among the proposals pitched to the board Wednesday is reconfiguring the parking lot, which would add only two spaces, or buying the adjacent Pan Am property as part of the reconfiguration, resulting in six new spaces. In the third option, the city would buy the Pan Am property and relocate the city electrician’s office to make way for 17 new spaces. The fourth would build the larger parking lot on the section of lawn. “This proposal is feasible but, (the city) will need survey and design work to determine the final cost and design,” according to Greene’s memo.